Walking & Rolling to school (even part way) is the healthiest way to get to school. Be a safe pedestrian. Visit ICBC site to see tips for pedestrians and drivers. 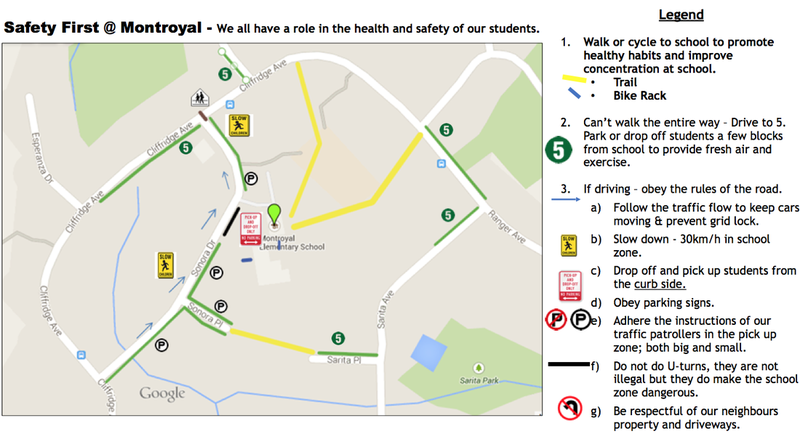 We encourage walking or cycling to school to improve students’ concentration and overall health, plus with the current construction projects, it may be faster for students to walk in groups, so parents don’t need to add any more time on to their morning. If the walk is greater than 15 minutes; drive to 5, which is driving a few blocks from school and allowing students the chance to get some fresh air and exercise. 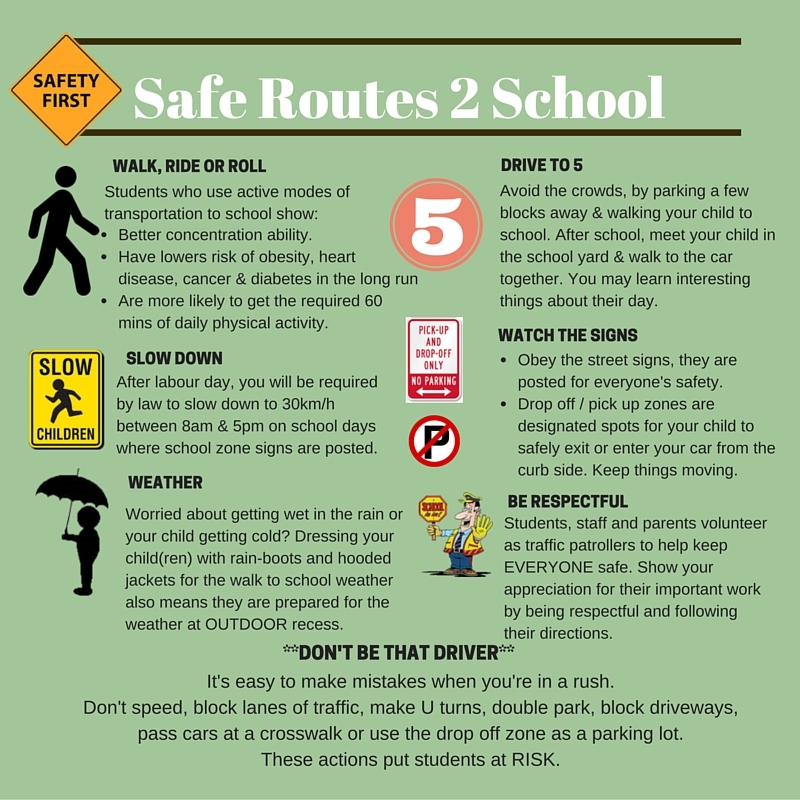 It is a good idea to remind our students how to be safe pedestrians and cyclists by using – STOP – LOOK and LISTEN while traveling to and from school. ICBC has a great parent guide to assist with your conversation. Follow the instructions of our G5 Move It Team. Students enter car at the top of the pick-up zone,by the patroller with the stop sign. This prevents cars pulling out unexpectedly or at the same time. The process may take longer but it prevents accidents. Ensure backpacks are kept in the back seat. Used for students who can enter and exit the car independently. Communicate with your child to meet at drop zone at 3:10 – this gives them time to get out of class and avoids the need to circle. 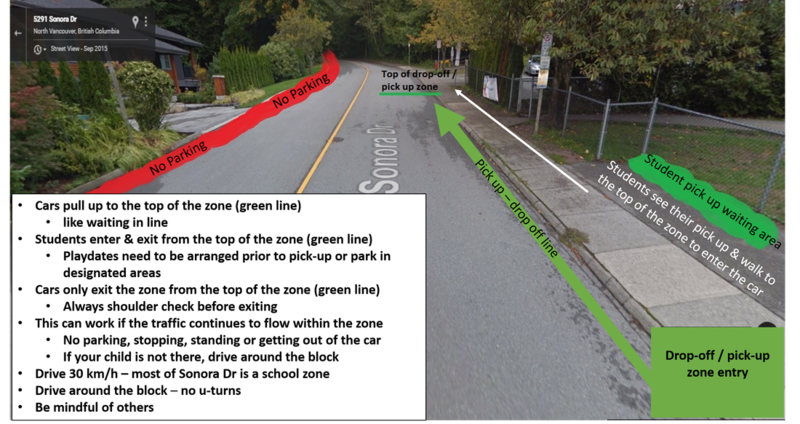 Playdates are arranged by parking and walking to the school yard and not in the pick-up zone. Use your indicator and always do a shoulder check to ensure it is safe to pull out of drop off/pick up zone. Protect the young minds and lung working within the school, if you arrive early and park, turn off your car engine to reduce the harmful emissions. 30 km/h in the school zone. Come to a full stop at stop signs. Watch for pedestrians at crosswalks. Have your child exit the car on the curb side and do not park on the west side of Sonora Dr. and beckon your child to cross the street. This is extremely dangerous particularly in dark, inclement weather. Keep our neighbours’ driveways clear, let’s be respectful. U-turns are not illegal but they are dangerous in school zones, we are on crescent, please drive around. Adhere to the instructions of our G5 Student Patrollers, they are volunteering their time to reduce the risk of accidents. The Montroyal parking lot is for staff only. Walk around, not through, the staff parking lots. If all families followed the suggested traffic flow highlighted on the map with blue arrows between 8am – 9am and 2:30pm – 3:30pm, it would reduce the risk of accidents, and keep traffic flowing. The Traffic Safety program at Montroyal is a joint effort between the School Administration and our Grade 5 parent volunteers and student safety patrollers. This program provides not only a safer place for all of our children during pick-up time at Montroyal, it also provides an opportunity for the student patrollers to learn leadership and teamwork skills, and to develop maturity.